It is an absolute human certainty that no one can know his own beauty or perceive a sense of his own worth until it has been reflected back to him in the mirror of another loving, caring human being. Think back to when you formally trained to become an educator. How much time and how many course texts, readings, and activities were devoted to formally studying the complexities of working with students living with trauma, violence, and chronic stress? We often ask teachers this question when we provide professional development on the topic. Almost universally, across the United States, the common response we receive is that very little time or resources were devoted to studying this critical topic—especially as it applies to teaching students and working with their families. Rather, teachers tell us that they learn about what to do in four general ways: (1) by doing their best to teach students using trial-and-error strategies, (2) by learning from support staff, such as school counselors and others who engage in the psychosocial well-being of students, (3) by listening carefully at a school's child study team meetings when a variety of interpretations about students' and families' circumstances are discussed, and/or (4) by seeking advice from colleagues who have taught children with similar situations. What exacerbates this situation even further is the reality that most educators have little to no formal education working with students and families who represent cultural, linguistic, racial, and economic experiences that are distinct from their own (Bransford, Darling-Hammond, & LePage, 2005; Darling-Hammond & Rothman, 2015). Whether it is working with high or low incidences of people who represent the rapidly growing diversity among U.S. students and their families, most educators tell us what the professional literature has confirmed for years: Very few in our profession have had any formal training or depth of experience working with the large, growing, and changing population of diverse learners—let alone those living with trauma, violence, and chronic stress. The absence of any formal training in this area, understandably, has led many teachers to feel quite unprepared to teach and work with this population. Further, many teachers believe that some students' experiences are so extreme that there is little hope for them, despite all of the educators' efforts and good intentions. This perception often puts limits and restrictions on teachers in terms of how they teach and interact with students, as well as how they work with families. In a real sense, it has almost forced many teachers to look at students and their families as "broken" instead of as individuals who already possess inherent strengths and who can make great contributions to their classrooms, their communities, and the world. Indeed, for too long, teachers have found themselves using language to name their perceptions in terms of what they believe are impossible situations for students living with trauma, violence, and chronic stress. Here is an example. While we were writing this chapter, one of us conducted a schoolwide training in an impoverished industrial city in the Northeast. She asked pairs of teachers to describe strategies that they found to be the most successful in their work with students living with trauma, violence, and chronic stress. While there were many different responses from each pair, one in particular resonated with the group. It went something like this: "I know that I am working hard, but it is impossible when I know that I have students who don't know whether they have a bed to sleep on at night, who worry about one of their parents who is incarcerated, or who come to school hungry." As you read this, you might find that you feel or have felt like this teacher. We acknowledge this reality, as well as the fact that many caring educators spend great amounts of their time and energy trying to minimize the effects of adversity on their students while simultaneously supporting them to succeed in school. Having said this, we also want to share our excitement about more recent evidence-based research that shows promising practices for teaching students living with trauma, violence, and chronic stress and working with their families. The foundation of this book is based on these findings. What we propose is to take it a step further and look beyond "what is lacking" to find "what is already there" to effect change and sustain progress. Renowned pediatrician, professor of pediatrics at Children's Hospital of Philadelphia, and director of youth services at Covenant House Pennsylvania, Kenneth Ginsberg (2015) tells us that our students are "not broken" despite the many odds that they face. He urges us to look at our students in a different way so that we can see their many strengths and assets and tap into their natural resilience to improve their outcomes in school and beyond. An example that Ginsberg uses to illustrate this important point is his work with children who are chronically ill and their families. While he acknowledges the effect that chronic illness has on children's lives, he also points to the many strengths that the same children possess. Pushing his thoughts further, he discusses the importance of using these strengths to support students to become more confident, more competent, more connected and contributory to others, more committed to integrity, more able to cope, and able to have more control over their lives to make healthy choices. How can we move from feeling defeated, helpless, and hopeless in our beliefs about students experiencing trauma, violence, and chronic stress to being lighthouses of hope, high expectations, and appreciation of our students' and their families' inherent strengths? 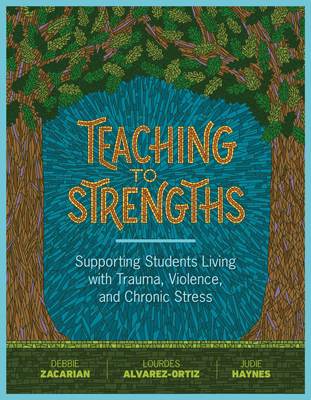 In this chapter, we explore three critical and foundational elements for working effectively with students living with trauma, violence, and chronic stress. We use the illustration of three strands to show how interweaving these elements together forms a tight braid or bond. We have separated this chapter into the following three sections to reflect our braid framework. The first section includes key evidence-based tenets of strengths-based teaching that we use to identify and acknowledge the inherent assets and capacities of students and their families to help us in creating and/or strengthening our teaching practices. The second section is devoted to exploring some key principles for working with dynamically changing student and family populations. We examine some of the key concepts for understanding culture as a way of being and acting as it relates to child development. The third section focuses on the importance of supporting student learning and thinking through interactions. We do so by drawing from the seminal contributions of developmental psychologist Lev Vygotsky (1978), who posited that student learning occurs through two interdependent systems: cognition and social interaction. The intent of this chapter is to explore the possibilities that can occur when we use this braided framework. We draw from it to build on students' inherent strengths, connect with their cultural ways of being, and create opportunities for students to learn through interactions to expand their ability to cope and help them become confident learners and active members of their classrooms, school communities, and beyond. Let's begin by engaging in a reflection activity intended to help us explore some key principles about students living with trauma, violence, and chronic stress. As we stated in the Introduction, all of the reflection activities found in the book are intended for applying and extending the key ideas to our personal and professional lives. They are also intended for two types of audiences: individual readers and groups of readers, such as those in a college course, professional learning community, or book study group. Read the following descriptions of three different 9th grade classmates attending an urban high school in a southwestern U.S. state and respond to the subsequent reflection questions. David was born in the United States. Many years ago, his older brother and parents crossed the Mexican border without documents. For this reason, they live in constant fear of being deported. David and his family have moved many times. In school, David generally earns B grades with an occasional C, and his teachers describe him as a pleasant and hardworking student. Brianna is the oldest of three siblings and lives with her grandmother. When Brianna was in 7th grade, her mother was killed in a car accident. We have been asked to observe Brianna in class and see that she tries to follow her teacher's directions diligently. We also observe Brianna's mathematics teacher correcting her on a problem set that she has just completed. Pointing to the board at the correct formula for solving the problem, her teacher says to Brianna, "You will want to use this formula for substitution on the Pythagorean theorem." Upon hearing this, Brianna breaks down in tears. We also note her classmates moving away from Brianna and a few stating, "There she goes again." Jasmine is an only child who lives with her parents. Jasmine's father has been in and out of drug treatment facilities for alcohol and drug addiction and the prison system for related offenses. Most recently, he was released from the local jail after a fistfight that he instigated at a local bar. We learn that Jasmine has witnessed several acts of violence between her parents—particularly her father against her mother. Her teacher reports to us that Jasmine rarely misses school and that when she works in groups with other students, she often seems to pick an unprovoked fight with her classmates. 1. What assets can you identify in each student? 2. How might you draw from these assets in your work with students? Honor, value, and acknowledge these strengths. Help students become aware of their strengths. Build instructional programming that boosts social ties and networks by drawing from students' strengths. These four elements are essential to teaching students living with trauma, violence, and chronic stress. And they bring us back around to the first reflection task. How easy was it to identify the various strengths of the students? Many educators tell us that it is challenging for them to find any strengths for the last student, Jasmine. They have shared with us that they just don't see how her circumstances and what she does in school reflect any assets. So let's go back to Jasmine for a few moments before we enter into a discussion about the principles of positive psychology. In the description, we share that Jasmine comes to school every day. If we think about this, despite whatever we perceive about her home life (and we have not furnished much about it in terms of the relationships that she has with her mother, neighbors, family's community, and more), she is coming to school regularly, consistently, and routinely. This is certainly a strength that she possesses. It shows responsibility, value for education, value for interactions, hope, appreciation, gratitude, determination, connection, and courage, to name a few of her values and qualities. What this points us toward is the research encouraging us to look for specific student strengths so that we may draw from these in our work. Psychologist Abraham Maslow's (1999) contributions help us understand the possibilities of what can occur when we look through our strengths-based lens. Principles of positive psychology. Maslow (1999) pioneered the idea of looking at human behavior through the lens of the assets, capacities, and qualities that empower people and their communities to flourish. He coined the term positive psychology to reflect this idea. Positive psychology is a belief that, as humans, we all want to be the best that we can be and that it is in our nature to strive toward what Maslow refers to as our self-actualized potential. It positions human behavior as being driven by the desire to lead richly meaningful and fulfilling lives. Further, it does not ignore or dismiss the need to take time to understand the difference between what helps us achieve our potential and what doesn't. While not abandoning their roles as scientists of healing, experts in positive psychology (also referred to positivists) argue that we have to give as much attention to acknowledging and building positive qualities as we have given to repairing damage (Morris & Maisto, 2002). In addition, positive psychology expands beyond the self. It looks closely at the human potential for working and collaborating together. Interpersonal relationships, according to Maslow, are made more possible when we believe in each other's worth or value and when we mutually support each other to see our collective human potential. Earlier, we acknowledged that many caring educators spend great amounts of their time and energy trying to minimize the effects of adversity on their students while simultaneously supporting them to succeed in school. Part of this is our capacity to be empathetic educators; that is, educators who understand our students' circumstances and seek ways to make education meaningful for those students. The tenets of positive psychology require that we be empathetic and asset-based teachers. First, we must have an understanding of our students, and second, we must work from their strengths. Here is a small example that will be expanded on later in the book. Let's say that we are David, Brianna, and Jasmine's U.S. history teacher. In our course text, students are reading about the U.S. Civil War. The text talks about fathers and sons leaving their families to fight in the war. One of the activities created by the school district's history department asks students to interview their parents about what it would be like to leave a family member behind to fight in a war. As empathetic teachers, we likely would know that some students don't live with their parents. Indeed, Brianna lives with her grandmother. With this knowledge, we would modify the question to be more inclusive of all of our students, including Brianna and others. The same would hold true for making modifications for students who are homeless or living in shelters, or whose parent or guardian is deployed to an area of conflict, so that what we do is inclusive, respectful, validating, and honoring. In addition, if we changed the earlier examples to include a student who is an unaccompanied minor from a war-torn country and learning English, we would make second language learning modifications (such as asking a question that matches the student's level of English proficiency or asking it in the student's native language). We would also modify the question to be relevant and sensitive to the student's background. Furthermore, we would anchor all of these modifications on the students' previously identified assets. While later chapters explore these ideas in much more detail, the point here is that the foundational principles of positive psychology mean working from an empathetic understanding of students and their strengths. Further, we are drawing from these to bolster our students' confidence and motivation as learners. All students and families bring great assets and capacities. The human brain has a great capacity to build new pathways for being and acting (Floyd & McKenna, 2003; Lerner, Almerigi, Theokas, & Lerner, 2005). Let's look at the first element—that all students and families bring great value to learning. Moll, Amanti, Neff, & Gonzalez (1992) coined the term funds of knowledge to describe the expertise that families bring to their children's learning. They conducted research on families living in the border region between the United States and Mexico. Where some might say that the families were uneducated and therefore could not help their children in school, the researchers found the opposite. The families they studied possessed very high levels of knowledge and skills that related to their work, home life, and well-being. Further, and more importantly, these families passed the knowledge and skills on to their children. What is critical for us to consider as we begin to explore students living with trauma, violence, and chronic stress is that their school lives can be productive, positive, and fulfilling when we see the assets and strengths that students and families bring. A second and equally critical component to working with students and families experiencing these phenomena is that, as humans, we have the capacity to overcome the odds stacked against us. The scientific notion of neuroplasticity points to the brain's capacity to create new pathways. The latest advances in the field of neuroscience suggest the ability of the brain to "rewire itself," under certain conditions, giving us an enormous amount of hope in our work with students who have experienced trauma. What is important for educators to consider is how we contribute to creating an environment that capitalizes on this newly discovered inherent strength to benefit students and families. When we specifically teach students to believe in their abilities to embrace the challenges and complexities of learning. When we show students the value and purpose of being persistent. When we show students that we value effort as a positive. When we inspire students to do more. Each requires us to be positive in the language that we use, positive in our intent, and positive in our belief that all students can succeed. In a real sense, it means that we, too, have to possess the same four ways of thinking on behalf of student learning. Dweck contrasts having a growth mindset with having a fixed mindset, whereby we believe that there are always some students who cannot succeed—such as the teacher who felt hopeless about his students and helpless in teaching them that we referenced at the beginning of the chapter. The point is, once we have these fixed mindsets, it is almost a self-fulfilling prophecy that we cannot change and therefore cannot help our students succeed because we are convinced that nothing we do will work. According to sociologist Claude Steele (2010), these perceptions can and do negatively go so far as to affect some students who perceive themselves to be in a racial, ethnic, linguistic, cultural, economic, or gender group that is not expected to show school success. Just think of this fixed mindset as it applies to what we believe about students and what students believe about themselves or their peers. As educators, our individual perspectives always benefit from another point of view. None of us has all of the answers—especially regarding the complexities of teaching students and working with families experiencing trauma, violence, and chronic stress. We tend to see a partial picture of any whole. As such, it requires the support of others to help us see what is really there. Take, for example, Brianna, the second student we described, who cried during her mathematics class when her teacher asked her for information about how she had solved a problem set. As educators, we have a pivotal role in fostering an open and much-needed dialogue with students, families, colleagues, supervisors, and other stakeholders to ensure that what we do works for our students. While we know Brianna is hardworking, think of how much might be gained by engaging in a growth mindset dialogue with Brianna to help support her to embrace the challenges of learning math; acknowledge, honor, and value her persistence and desire to do well; show her how her efforts are valued; and learn how we might inspire her to do more. Our first step is believing in students' inner strengths; our second is identifying these strengths. Knowing that we are working with students from a wide array of personal, cultural, language, and economic experiences, we must be open to understanding and appreciating the various cultures of others. When we allow ourselves to be influenced and changed by different perspectives, and when we see these as strengths rather than obstacles, we embrace a growth mindset and, in turn, begin working toward a transformation model on behalf of our students. This leads us to the second of our three interwoven strands: the importance of understanding culture as a way of being and acting. Developmental psychologist Mary Gauvain (2001) helps us understand the critical importance of a family's cultural community in terms of children's development. Knowing that we are working with diverse and dynamically changing student and family populations, including students living with trauma, violence, and chronic stress, it is important to understand the various cultural communities represented in our local contexts. Here are some important features to consider when thinking about the importance of a family's cultural community. Children are guided to participate in their family's community and beyond both actively (e.g., engaging in family discussions) and passively (e.g., observing their family at home and in groups such as at a church ritual). Children learn how to act and behave through repeated exposure to, observation of, and interactions with their home and family communities. In contemporary society, the term parents/guardians, for example, has many meanings, including children being raised by two parents, a single parent, a blended family, grandparents, unrelated people who live cooperatively, or foster parents, and children being raised with significant support from extrafamilial individuals (Zacarian & Silverstone, 2015). The same holds true for the many different groups with which children routinely interact. In this sense, culture refers to the places where students interact to gain meaning from the world around them. As such, child development involves interactions between and among children, their parents/guardians, family, family's community, school community, local community in which they are reared, and beyond. Figure 1.1 illustrates the type of interactions that occur during a typical child's development. A growing number of school-age children are being reared in situations where violence, trauma, and chronic stress have had or are having a significant adverse effect on their development. This is not to say that all school-age children who experience trauma, violence, and chronic stress have these outcomes; the effect of these phenomena varies greatly. Factors such as students' age and level of development; culture; prior exposure to and experience with trauma, violence, and stress; and any pre-existing conditions that might affect a student or a student's family are all relevant (Cole et al., 2005; Presidential Task Force on Posttraumatic Stress Disorder and Trauma in Children and Adolescents, 2008). In addition, and of critical importance, are (1) the inherent strengths that many students already possess and (2) the external supports that they receive from others of unconditional trust and care (Ginsberg & Jablow, 2015). What is it that greatly helps these two critical elements occur? Interactions—consistent, routine, predictable, nurturing, and stimulating interactions, and lots of them. As shown in Figure 1.1, these include an ever-growing, ever-widening developmental circle of interactions. Indeed, students are exposed to many social connections/networks and interactions in their everyday lives. These occur over and over again and serve as the cement or glue that binds their development. Thus far in this book, we have pointed to the critical importance of students' inherent strengths and interactive capacities. Let's look back at the first student we described at the beginning of this chapter, David Martinez, to further illustrate what we mean about culture as a way of being and acting. David was born in the United States, and the undocumented status of his older brother and parents causes the whole family to live in constant fear of being deported. As empathetic educators, we understand the anxiety and chronic stress that the family is experiencing and want to support David to feel and be welcomed unconditionally in our classroom. With this said, let's add a few more details about David and his family in our quest to see their many strengths. He and his family have moved multiple times for several important reasons. First, they live in extreme poverty. At times, they live in cramped places with unrelated people in their attempt to secure shelter. They have lived in cars. They have spent small amounts of time living in apartments on their own. They are always on the move because of their concerns about being caught by the authorities, and they have never sought the types of nutritional, medical, legal, or housing support that many low-income U.S. citizens receive. Also, David's parents and brother do not possess social security cards or any legal documents out of fear that these would require them to declare their undocumented immigration status. As such, while we might believe that David is being reared without many of the social ties and interactions that many of us have probably experienced, he has had and is having a number of meaningful, continuous interactions with the various networks of people that are in his life. Here is an example. Every week, David and his family go to the laundromat that is closest in proximity to where they are living. They look forward to this ritualized activity. If we were to ask David what his favorite place is, he would tell us the laundromat. So let's say that we go with him every week and observe him and his family engaging in the weekly activity. What would we see? We would see him and his family having lively conversations with other children and adults while they all wait for the cleaning activity to be completed. These interactions and relationships reflect the collectivist culture in which David is being reared. What do we mean by collectivist? Research on educational practices show a distinction between a mainstream cultural belief that favors individualism and competition and a minority belief that favors collectivism and relationships as a way of being and acting (Tyler et al., 2008). If we look at David through this lens, he is being reared in a culture that favors collectivism and relationships. His family goes to the local laundromat for more than doing their laundry. They go as members of a collectivist culture to cultivate this culture. Indeed, they also gain invaluable support from these gatherings, as many of the families they meet experience similar joys and adversities. Generally, but not always, a family's community represents its cultural, linguistic, racial, and economic experiences. The interactions they engage in as members of the community further cement children's understanding of the world around them, as do the rules and mores of the culture in which they are being reared (Rogoff, 2003). In this sense, David's understanding of the world around him comes from these rituals of interactions that his family engages in on a regular basis with the communities at the laundromat. Let's push this a little further. David speaks two languages fluently, Spanish and English, and he often acts as his parents' interpreter. For example, when they move, David regularly engages in conversations with the family's landlord, as many do not speak Spanish. Because they move on a regular basis, he is deeply familiar with the rituals associated with moving in and out of various domiciles. In fact, if we observe David regularly, we see that he is quite adept at negotiating the rent and other activities that help his family's living circumstances. In a great sense, David's personal, world, cultural, and literacy knowledge is being nurtured by the practices that he experiences at home, at the laundromat, and elsewhere. Following this train of thought, ideally when he goes to school, he engages in interactions that show him that his background experiences are valued by his school community, which includes his teachers, peers, administrators, school counselors, specialists, and so forth. And as David grows up, his world grows larger to include his local city's community and beyond. Through adolescence, even though he may spend significantly less time with his parents and his family's communities, it is these circles of influence that represent what we know as students' cultural ways of being and acting (Zacarian, 2013). Let's look at the assets that David brings. The positive effect of social ties and interactions. David comes from a loving family that wants him to receive a good education and do well in school. As representatives of a collectivist culture, they believe in the importance of providing David and themselves with rich opportunities to engage with others. At the laundromat, David's family provides him with a high level of interactive social and networking supports. We use the word networking, as he is continuously and critically engaging in interactions. Indeed, each of these interactive experiences that he engages in provides him with the opportunity to extend his understanding of the world around him. In a sense, as educators, we have to think of this in terms of the interactive spheres of influence that support our students to learn. Figure 1.2 shows the various spheres of interactive influence and social networking that David engages in. Each person provides him, in his or her unique ways, with multiple opportunities to engage in interactions and to understand the world he lives in and how to thrive as well as flourish in it. What teaching strategies might you use based on these spheres of interactive relationships in which David engages? In what ways would these support David to learn? How would these strategies capitalize on David's assets? The first system, cognition, is built from prior knowledge or understanding. In school settings, we might refer to this as the subject matter being studied or method of learning being used, in combination with our students' personal, cultural, communicative, and world knowledge experiences. The second system, social interaction, we learn by communicating with others. It is equally important as the first. It requires students to interact with teachers, each other, family, their community, and beyond to have the rich opportunity to use language to learn. Figure 1.3 illustrates these two systems in formula form: cognition plus social interaction equals learning. A good example is David's demonstrated capacity to be a strong member in collaborative group settings. Through his understanding of and interactions participating in a collectivist culture, he has shown the capacity to work well with others by being patient, attentive, an active listener and speaker, a good negotiator, and more. As such, learning is both an internal (cognitive) and external (communicating with others) process. It requires us to support students living with trauma, violence, and chronic stress and bolster their instructional programming in multiple ways. First, to get students thinking, we have to know about their personal, cultural, language, and world experiences. That is, we must support students in building connections with the content that is being taught with what they already know. In doing so, we capitalize on students' assets and guide and encourage them to navigate more challenging territory with our support. This relates to Vygotsky's (1978) zone of proximal development. As educators, we need to continuously look for ways to provide students with multiple strengths-based opportunities to interact. In other words, if we know that learning involves social interactions, what can we do to ensure that these occur routinely and regularly? The key to making learning work is using the foundation of our braid framework. That is, adopting a strengths-based approach whereby teachers identify and acknowledge the assets and capacities of students, understand and value their cultural ways of being, and support and create opportunities for learning through thinking and social interactions. The next chapter explores the preparatory steps needed to work with dynamically changing diverse students and families living with trauma, violence, and chronic stress by focusing more closely on our first strand.